When my family added HBO to our cable line-up, I was one satisfied kid. I liked nothing more than sitting in our shag-carpeted rec room in the basement, watching movie after movie after movie, until my eyes were glossed over. I was a premium cable channel zombie, and proud of it. But there was one thing that brought me out of that TV stupor, and that’s when one of my sisters came down to the basement, plopped on the couch, opened a bag of Fritos, and started crunching away. One, that crunching sound—like someone chewing river gravel—penetrated my brain like a dentist drill. And two, that aroma that came from eating Fritos was horrifying to me–a mixture of dirty socks crossed with bad breath and burnt popcorn. Even if I was watching Boy in the Plastic Bubble, right at the part where Tod is about to risk death by leaving his bubble for the girl next door, I’d run from the rec room to escape that smell. I’ve always been acutely aware of scents and sounds, which as a kid concerned me. None of my friends ever seemed to be bothered by these things. Was I part beagle? Alien? Cyborg? Why was I the only one so affected by these two senses? I mean, I can hardly follow the story line of a movie in a theatre because of the open-mouth-crunching popcorn eaters (who seemingly go unnoticed by everyone else). If I’m a half block downwind of a person with body odor or halitosis, I’ll hold my breath until I pass out. If someone within a mile radius of me is doing that thing where they pop 80 bubbles in rapid machine-gun-succession every time they chew down on a piece of Juicy Fruit, I pray for a piano to fall on them from above. I don’t think I’d mind the sound of the piano crashing even one tiny bit. At 7972.4 feet up in the Andes at Machu Picchu, I finally discovered fresh air in Peru. exchange student, I was overwhelmed with the general stinkiness of my host country, Peru—so much so that I applied cologne under my nose every time I went outside. It was a tough decision every day: Do I reek of Hai Karate or Aqua Velva, or do I allow the scent of human urine and poo and diesel fumes and rotting garbage to enter my nostrils freely? Now granted, I’m sure New York and Chicago have similar odors, but I was a Midwestern boy from a small town who was used to smelling fresh cut grass, Herbal Essence shampoo, and ham and cheese casseroles in the oven. Aside from the cabbage field by our house that smelled like farts near harvest time, my town smelled pretty good. Even the boy’s bathroom at my school didn’t smell bad, although I did have an aversion to the scent of that sawdust-looking stuff the janitor sprinkled when a kid vomited in the classroom. And that sound of vomiting would make me want to…well, you know. Italy…I can’t smell any B.O. up here. backpacked through Europe during a college summer, I remember a 10-hour overnight train ride down the length of Italy in which I shared a small unairconditioned compartment with several very ripe-smelling, older gentlemen. By hour two I had rubbed a full tube of cherry Chapstick under my nose (the only pleasantly scented substance I could find), but I was still inhaling that musty, vaguely chicken soupish, sour-wash-cloth odor. Finally, I chose to surrender my paid compartment seat, and squatted on the floor in the narrow train corridor where every person on the entire train bumped into me at some point. I didn’t get much sleep, but my nostrils were pleased. No burning suitcase smell up here! When we lived in Mali a few years ago, I recall sitting on the couch in our house one day with the windows wide open, a fresh, spring breeze drifting through the windows. Then before I knew it, an acrid, chemically smell invaded. As I slammed the windows shut I saw a trash pile burning across the road where an old vinyl suitcase had been tossed right on top. I can still conjure up that smell in my head today. We also lived a couple kilometers from the abattoir, which is a beautiful sounding French word for slaughterhouse. Sometimes if the wind blew just the right way, the scent of butchered sheep and cows resting in the warm Malian sun would make its way to our windows. I’m still deciding if that aroma was worse than the blazing Samsonite. 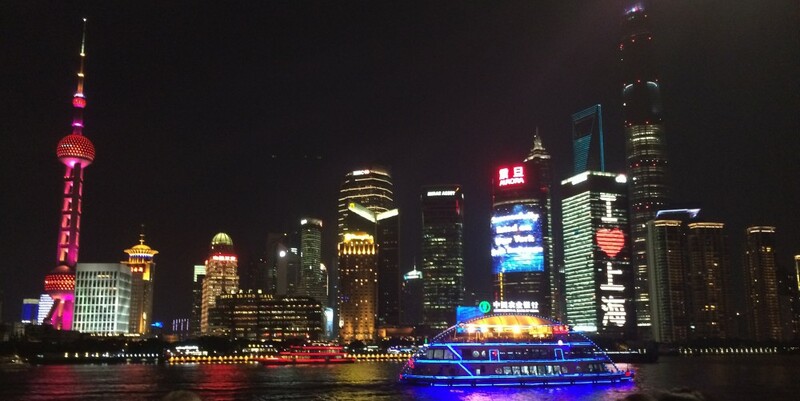 We now live in Shanghai, the world’s most populous city, where my nose and ears get a workout every day. For example, the wet market, a place where vendors sell fresh meat, seafood, and produce, is a stone’s throw from our apartment building. When we first moved to this neighborhood, we thought this would be a real plus—inexpensive, fresh food straight from the farmers and fisherman, right at our doorstep. But on our first visit inside I was sure I’d entered a recently unsealed crypt full of mouldering bodies. The stench was overwhelming. Plus, there were mounds of guts from fish and eels and other bizarre water creatures that were still wriggling. I fled, dry heaving into my shirt that I had pulled over my face. The only thing that would have been worse is if everyone was eating Fritos in there. AM. And I can tell you with confidence that the very last smell you want to encounter in the pre-dawn hours is rotting seafood. But fish markets always smell bad, you might argue. But trust me, this isn’t a fresh-fish-sitting-in-crunchy-ice kind of smell one would encounter at, say, Pike Place Fish Market in Seattle. That smell is almost pleasant, with a vibe that reminds you of a sleepy fishing village with colorful boats bobbing in the harbor. But this wet market has no such vibe. Nope, this vibe is more of a “you slipped and fell into the carcass of a decomposing sperm whale that had eaten a tanker ship full of vomit.” It’s a place where the juice from those underwater creatures has run into cracks and seeped into the concrete to fester in the humid Shanghai air, day after day, turning into something that I believe could be used in warfare instead of nuclear bombs. Seriously, this odor would bring anyone to their knees–and yet, the wet market it is crowded with shoppers all day long who are certainly not dry heaving into their shirts. It’s more than just scents here in ol’ Shanghai, though. For me, the sound that is synonymous with this city is that awful noise people make when trying to clear their throat to gather phlegm for spitting (seriously, just hearing someone say the word “phlegm” is an assault on my eardrums). But hearing the actual expulsion sound is cringe inducing for me. And trust me, I cringe a lot, because I hear it all day long, even through the closed windows of our third-floor apartment. Even when I’m wearing Bose Noise Canceling headphones. Even when we’re inside a restaurant and someone does it outside on the street. And probably even when I’m inside a submarine in the Mariana Trench 35,814 miles below sea level. It’s horrific, like someone is hurking up a chunk of lung. And everyone does it—young people, elderly ladies, probably famous Chinese movie stars. And as with the wet market experience, this sound causes me to dry heave. Of course, there is the foul aftermath of this sound to contend with as well, which is why the sidewalks here are always dotted with wet spots and why I look down when I walk on the sidewalks here, and why our shoes have never, ever touched the floor inside of our apartment. No lung matter on my shiny wood floors, please. Regarding this spitting thing, I’ve actually heard people say that it’s “cultural.” Yeah, no. I fully honor and embrace the many cultural differences I’ve encountered here, like how Chinese people avoid confrontation, or have no sense of personal space, or how they talk so loudly that I think they are arguing when they’re just chatting about buying eels at the wet market. But hocking up a big loogie is not a part of any culture—it’s just a terrible habit, like picking your nose or making those loud sounds when you yawn. It’s a habit that one could kick by simply drinking some hot tea, or maybe by not eating slimy, wet market sea creatures that look like they belong in a horror movie. In the meantime, for the morning walk to the bus stop I’ll be dabbing under my nose a generous amount of Gucci Guilty Black Pour Homme cologne, a scent highlighted by notes of coriander and lavender but also with base notes of patchouli–a combination that creates a scent that’s bold and noticeable without being overpowering (or so the reviews say). As long as it’s powerful enough to mask rotten shrimp and Fritos, I’m good. 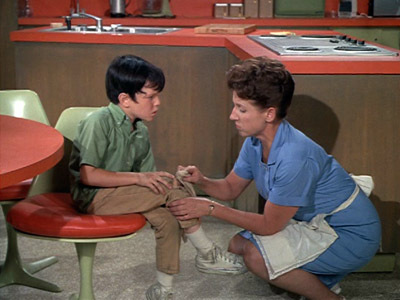 Brady Bunch taught me that maids wore powder blue frocks, gave you something fresh-baked when you were down in the dumps, and lived in some mystery room located in a vague part of the house (Alice rocked!). 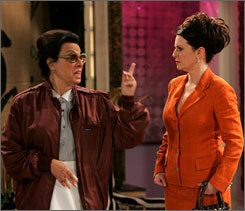 Rosario lets Karen Walker have it. nanny but probably weren’t the best choice in terms of teen girl supervision. Rosie from the Jetsons taught me that robots can totally pull off a French maid’s uniform. And really, what else does one need to know besides that? Well, maybe a little more. My first real life exposure to a domestic happened when I was a 16-year-old exchange student in Peru. I lived with a middle class family—two teachers and their four kids—and a maid who would just sort of materialize at times. She was young, probably about my age, and unlike Hazel or Rosario, she hardly ever uttered a peep to her employers (least of all some witty, Rosario-like retort such as, “I’d ring your neck, but I don’t want to be standing in a puddle of gin!”). Nope, this gal kept her head down, no eye contact, and kept occupied doing things like boiling stuff on the stove. Now the first time I lifted the lid off one of her boiling pots it contained everyone’s white underclothes, and the second time it was fish heads, so suffice to say I didn’t do a lot of lid-lifting after that. She also went to the market every day to buy the foodstuff we would eat at lunch and supper. I went with her once, and credit her with making me understand that guinea pigs can be pets or entrees. Our maid in Peru, rockin’ the big cuffs. One day I asked my host brother Paco where this maid lived. “On the roof,” he answered matter-of-factly. I immediately envisioned her curled up in an abandoned pigeon coop or sleeping under a lean-to propped against the chimney. Then I made my way up there one day and saw that there was, in fact, a little structure that I supposed was a maid’s room and while small, was really private with a great view of the neighborhood. I’m pretty sure that Alice on the Brady Bunch would have been pleased with this scenario as she could have easily smuggled Sam the Butcher up here without anyone knowing a thing. I later found out that maids here came from poor families and only made a few dollars each week, which is why most middle class families could afford to have one. They certainly weren’t as beloved as Hazel or even Rosie the Robot Maid, and I sometimes winced at the way the family spoke to ours. I was even told by the family one time that I shouldn’t speak with ours unless I needed her to do something. Small talk be damned! In my previous career as a landscape architect, I designed the front lawn area for a media mogul whose mansion sat on the Atlantic Ocean in Palm Beach. At the firm where I worked we rarely did residential work and now I understand why. I was given the task of creating a preliminary design, and then a few of us paid a visit to the home. We, of course, had to park in the service area and were ushered into the back door by a gaggle of housemaids wearing crisp, black and white shifts. They led us to an area inside the door where we sat on a bench, and in hushed voices they told us to cover our shoes with velvety cloth covers, not to touch the walls as we walked up the stairs, and various other instructions that would ensure no trace of mere mortals would remain once we departed. They led us up a sweeping grand staircase, and I couldn’t help thinking how much our velvety foot covers were polishing each marble step, or how easily we could have slipped right off and plunged to our deaths where, I was sure, no trace of our blood would be left behind. At the top they led us down a darkened hallway where every door was closed. We stopped in front of a set of double doors where one maid tapped so slightly I wasn’t sure it even made a sound. The door opened and there stood the mogul and his wife, bathed in glowing light, like some Renaissance Medici portrait. They glanced at our shoes (feet covered, check) and pointed us inside the master bedroom while the maids disappeared back into the dark hallway. Our project director made quick introductions, but there were no handshakes, probably because we didn’t have velvety hand covers. Then she quickly explained that I had roughed out an idea for the lawn that included fountains, plantings, paving crafted from baby unicorn horns, and such. I unfurled my drawing and the mogul and his wife nodded as I explained each part. Then they explained why we were in their bedroom, thank goodness, as I was beginning to think this was going to turn in to one of those “Eyes Wide Shut” party scenarios. Mr. and Mrs. Mogul felt that from the balcony off the bedroom they would have a bird’s eye view of the front lawn, and could better imagine my design in place. There were indeed fabulous sets of glass doors across the front of the bedroom, offering sweeping views not only of the money-green front lawn, but of the sapphire blue Atlantic Ocean. For a few minutes I tried to explain where each part of my design would happen (“Now, over there by the Central American gentleman trimming your grass with sterling silver scissors will be the first statue, and over where your Labradoodle and Chihuaweiler are enjoying their pâté and finger sandwiches will be the fountain, etc., etc.”). Then because Mr. Mogul was having difficulty imagining the new design, he asked if I might go to the lawn and indicate the exact layout of each feature. We did have marking paint in the car, sort of a powdery, neon orange spray paint we used to “draw” on the ground, so I grabbed a can and a measuring tape and headed to the front lawn. My actual design completed, photographed by a secret drone. For the next hour I was like a petite video game character controlled by the Moguls up on high. I’d spray a line and they’d shout from above, “No, no, further to the left.” And I’d kick the old line away with my foot and respray. Then, “No, too small!” and I’d scuff away the paint and spray a larger diameter circle to represent the Dom Pérignon-filled fountain. To think I had pitied the housemaids who seemed so controlled over, and now I was the one with a joystick up my rear! But in the end (haha) the design turned out great, which just goes to prove that video game characters are people too. I once accompanied a photographer friend on a shoot at another waterfront mansion. We had the run of the place since it was off season and this hotel-sized abode was merely a vacation house. As we were snooping, I mean, looking around for new angles to photograph, we found ourselves in the laundry complex. It was easily as large as apartments where I had lived, and included industrial sized washers, dryers, steamers, padded tables for clothes folding, an array of shiny silver irons, and some sort of medieval-looking contraption that I was sure was a torture device for maids who had disobeyed (or maybe it was a clothes presser, whatever). Of course this showroom of laundry appliances served a whopping two people (who apparently changed their clothes every 12 seconds). Then, tucked on a shelf crowded with exotic detergents from Europe, we found the mother lode….a series of little wooden models of beds, complete with headboards, tiny cloth blankets, and little silk pillows. On the base of each model was a label that said “How to Make the Greyson Bed” (name changed to protect the innocent). Yep, the household staff was immune to bed-making blunders because they had a precise model to follow! We did look around for other models (e.g. “How to Wipe the Greyson Butts”) but came up empty-handed. Both Jamey and I sometimes earned extra money by helping a couple of local companies decorate Christmas trees in Palm Beach for the holidays. We would arrive at a mansion with a massive evergreen imported from Lapland or wherever, then wrap the interior trunk and every branch with a gazillion white lights that could easily illuminate Carlsbad Caverns from top to bottom. —supplemented by box after box of even fancier ornaments we bought at overpriced local boutiques or antique shoppes—to hang on each bough, often along with fresh pears, apples, and pomegranates, as well as fresh roses and hydrangea with their stems in tiny tubes of water, as well as tiny baby reindeer that would wiggle and coo (okay, not really reindeer, but they would have if they could have). And where were the families as all of these decorating festivities were occurring? Why, sitting on the couch watching, naturally! 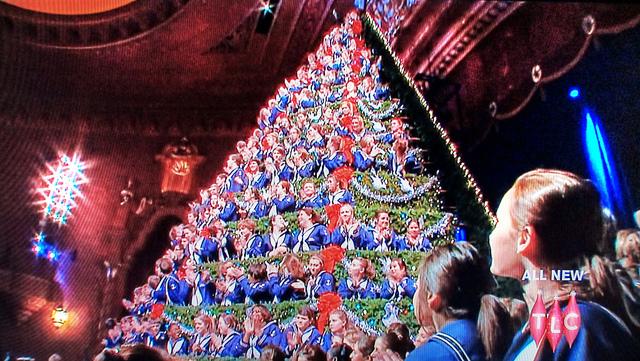 Apparently it’s an annual holiday tradition…the “watching of the help doing the Christmas decorating.” Which made it even a little weirder that many of these families were Jewish. So that was my extensive background knowledge regarding household help. Mostly these were worlds I would really never be a part of, something I was reminded of each time I was scrubbing my own toilet bowl or scraping off some random, dried, really sticky substance from the refrigerator shelf. I was my own household help, without the powder blue uniform and crisp white apron Alice wore so well (although I was pretty good with Hazel/Rosario-style one liners). So imagine my surprise when Jamey and I found ourselves in our own Downtown Abbey-like arrangement here in sub-Saharan Africa. After we had signed our contract to teach at the American International School of Bamako, we received an email explaining that we would have a guard posted at our home 24 hours/day, paid for by the school. Since we had pretty much sold everything we owned before arriving, these guards would be protecting such valuable commodities as our collection of Old Navy boxers and our rare assortment of toiletries purchased from Target (that’s tar-JAY, by the way…very French). 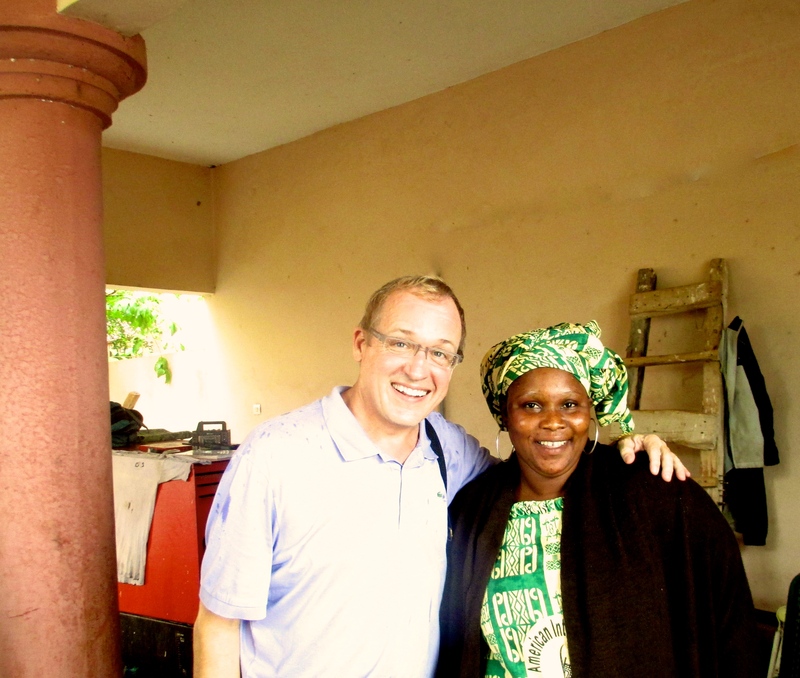 Then we were asked if we wanted to keep the maid, Fati, and gardener, Oumar, that were currently working at the house. The maid’s salary at the time was $150/month, and she worked 5 days a week, 8 hours/day cooking, cleaning, shopping, and doing the laundry. The gardener came twice a week for 4 hours at a time and was paid $50/month for cutting the lawn, planting and caring for the flowers, trimming hedges, watering, and sweeping paved areas. It took us 1.5 seconds to decide “yes.” Lady Grantham, eat your heart out! Having household help was an interesting adjustment for us. Fati, our maid extraordinaire, certainly has made me feel like Lord Grantham. I remember that feeling I’d get back in Florida when I’d spend all day Saturday cleaning the house, doing the laundry, and taking care of the yard. I would be wiped out by evening, but everything looked so damn sparkly good that I didn’t care. I’d marvel at how shiny the fixtures looked, how the wood floors gleamed, how the yard looked so manicured. Now, that’s the feeling I get EVERY day when we return from school, except we don’t have to lift a finger and can just lounge on the sofa and eat bonbons and throw the wrappers on the floor (full disclosure: Not only do I NOT throw bonbon wrappers on the floor, I do a before-the-maid-gets-here cleaning so she doesn’t think we are cavemen). One of the many downsides I’d discover about to doing your own housework is that two days after cleaning, everything is a mess again (I’m not blaming this on Jamey per se, but let’s just say that our ideas about cleanliness differ somewhat). Then you just start to dread the weekend when you have to do all of that housework yet again. Now the dread has vanished. We come home from school each day to a sparkling clean house with tile floors so shiny we could skate on them, or at least do one of those Tom Cruise slides from Risky Business (except wearing pants because I don’t think maids should see our Old Navy boxers). The bed looks hotel-ready with plumped up pillows stacked squarely on top of each other, crisply folded edges, and the sheet turned down just so. The sinks, toilets, and showers glisten without a water spot in sight. Often there are fresh flowers on the table in a glass vase (which we now pronounce “vahz” because we are just like the Crawleys or the Moguls at this point). My favorite meal is the one someone else cooks. Thanks Fati! didn’t have to cook ourselves. Yep, every afternoon dinner awaits on the stove, a fully cooked meal in a sparkling clean kitchen. It’s almost like that device the Jetsons had in their kitchen, where they would press a button and a turkey dinner or massive plate of spaghetti would appear. Even better, when we finish eating we just leave the dishes in the sink, where, on the following day, we find them miraculously clean and put away in the cupboard. But wait….there’s more! Next we wander into the bedroom where the dirty clothes from the previous day are clean, ironed, and folded. Fati even irons the socks. It’s the same with the yard. Just as the bougainvillea or the pomegranate tree or the lawn is about to appear unkempt, we come home to find it all trimmed to perfection. Our vegetable garden is planted, composted, watered, de-weeded, and harvested for us, but I still say, “Look at these tomatoes I grew in my garden!” In three years I’ve done dishes twice (emergency situation), and just a month ago I took out the garbage for the first time (I actually did not know where it went, and the guard took it for me). Speaking of guards, we have two that take turns on 12-hour shifts. They open the garage door when we arrive or leave, carry our packages to and from the car, wash the car every day, water everything that grows, feed our cat when we are away, sweep the dirt road in front of our house, and pre-screen any visitors by ringing the bell and letting us know whose waiting outside the gate; we decide if we’ll will/won’t have an audience with the visitor (It’s all very Pope-like). 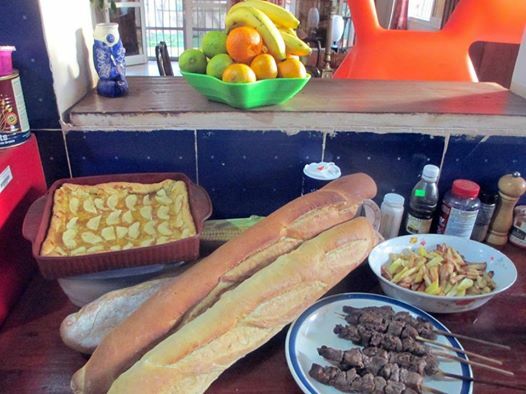 The school pays their less-than-$200-per-month salaries, but we supplement that and also give them dinner occasionally because, well, we couldn’t sleep at night if we didn’t! It’s disconcerting to go from the near-bottom of the economic pyramid (lowly teachers in the U.S.) to the near top here in Mali. 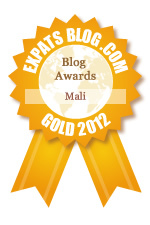 Our modest teaching salary, nearly 20 times higher than what Fati our maid makes, makes us the Palm Beachers of Bamako. So before we ever make any requests, we always decide first if it is Mali-normal or Palm Beach-weird because we definitely don’t want to be one of THOSE guys. Take, for instance, sock folding. After Fati launders and irons our socks, she folds them, but individually, thenstacks them on the dresser. 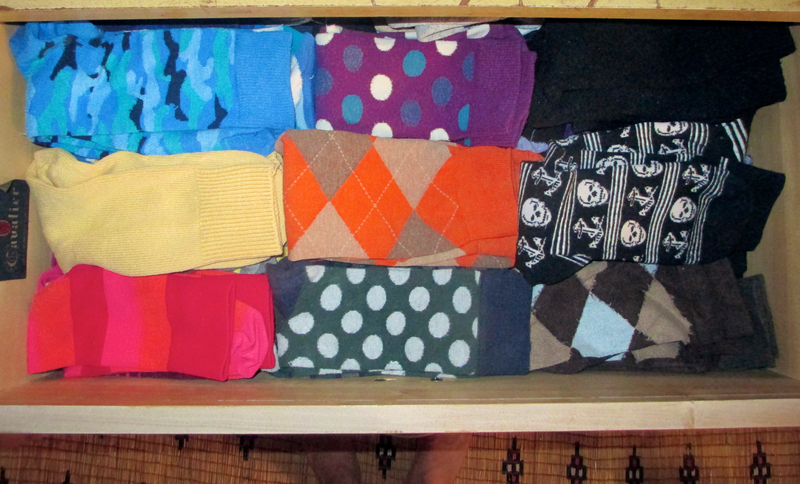 Now this means that I’m forced to unfold the two individually folded matching socks, put them together, then refold them as a pair before putting them in the sock drawer, which, by the way, I have arranged by colors from primary to secondary (red, yellow, blue, green, orange, purple, brown, black). Asking her to fold them as a pair and put them into the correct colored stack in the drawer? That would be Palm Beach-weird. So I do my own sock refolding, laborious as it is. We all have to make sacrifices, you know. 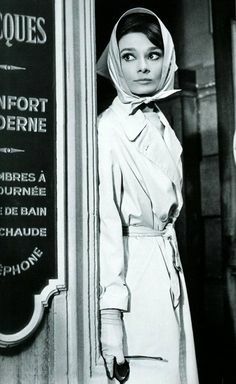 Audrey Hepburn and her trench coat. She has no medical conditions. And also unlike the Crawleys, we do take the time to chat with our household help every day, and get somewhat involved in their personal lives (our guard Niambele’s family picture is on our fridge). 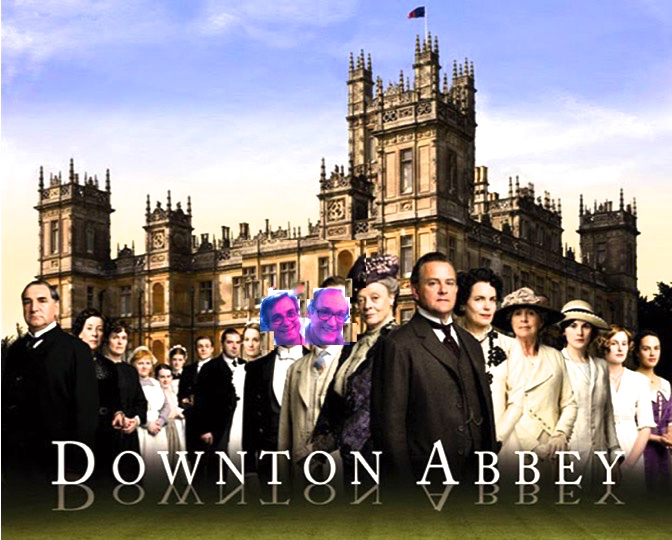 Now granted, on Downton Abbey there is no mixing of the help with the aristocrats—well, except for the chauffeur who married one of Lord Grantham’s daughters, but we don’t have a chauffeur, although we could for about what we pay the gardener. We’ve loaned/given them money (for school fees, to build a room onto a house, for driving school). On every trip we take we bring them all back a gift, and we give them a double salary during the Muslim holiday of Tabaski. We even bought a donkey for one of our guards whose previous animal was donkey-napped (it happens). We don’t take Fati or Oumar or Niambele or Sidibe for granted, and we certainly appreciate the hard work they do to make our lives easier (and much, much lazier). I would hope that Lord Grantham, the Bradys, Karen Walker, the Banks family, and the Jetsons felt the same way. And I can assure you that I’ll never direct Oumar’s landscaping from my perch on the roof deck, nor create a model for Fati of our preferred bed-making style, or even have them decorate our Christmas Madagascar Dragon Tree while we watch. That’s just Palm Beach-crazy.